Stanislaw Marcin Ulam (April 13, 1909 to May 13, 1984) was a Polish mathematican. He made important contributions in mathematics, including in the areas of algebraic topology, ergodic theory, number theory and set theory, as well in physics, especially nuclear physics and the study of dynamical systems. He may also have been the first person to propose the idea of a technological singularity; in 1958, the year after John von Neumann's death, Ulam described a conversation that the two of them had once had on this topic. Ulam contributed to the Manhattan Project, and together with Edward Teller proposed the Teller-Ulam design for thermonuclear weapons (known publically for 30 years as the "Teller-Ulam H-bomb secret"). Although Edward Teller is often popularly know as the father of the H-bomb, according to the German-American physicist and Nobel laureate, Hans Albrecht Bethe, (who also worked on the project), it would be more accurate to say that "Ulam is the father, because he provided the seed, and Teller is the mother, because he remained with the child." (The exact contributions of Ulam of Edward Teller, and how the Teller-Ulam design was arrived at, has been a matter of public and private dispute since the 1950s). 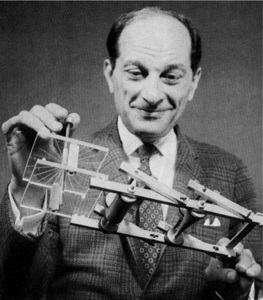 Stanislaw Ulam was the first person to conceive of external nuclear pulse propulsion, which is of course the basic idea behind Project Orion. Apparently he began to think about using atomic bombs as a means of propulsion, the day after the Trinity atomic bomb test in 1945, and had thought of the idea of external nuclear pulse propulsion by 1946. At the end of his life, Ulam declared that this was the invention of which he was most proud.